If you’re between the ages of 18 to 35, you’ll want to check out our active and growing Young Adult communities! No matter where you are on your faith journey, life path, or location in life…you are welcome here. Some of us are college-aged, some are young singles, and some are part of young families. In fact, many of us fall into more than one of these categories. We live across the St. Louis region and together we have fun, laugh, cry and support each other in this journey of life. No matter who you are, there is room for you at the table. Our Pastor of Young Adults, Rev. Winter Hamilton would love to help you get plugged in! She enjoys taking people out for coffees and ice cream. We get it. No one likes being labeled or “put into a box.” Most of our folks between the ages of 18 to 35 fall in at least two categories, but could never fully be described as any of them. Here are three very broad strokes describing just a portion of who we are as a community. 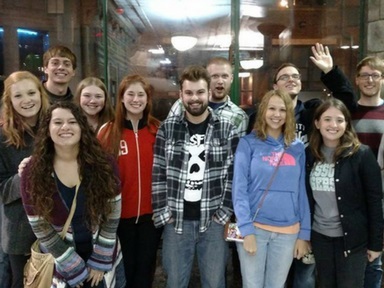 The Young Adult Ministry has college-aged folk. Some attend school, others do not. Some are working, others are not. Those who attend school may attend school in the St. Louis area, whereas others are far from home. For our out of town college students, we stay connected through care packages and letters. We are currently looking to hire a Maryville University Student for a paid internship at Manchester UMC. If you are a Maryville University Student and are passionate about God and want to grow in your discipleship, please contact Rev. Winter Hamilton. Please email Winter Hamilton with updated college addresses. Really? Young singles? That’s the name we came up with? We know, we know. You haven’t quite settled down all the way, but you are probably paying most of your own bills. Maybe you’re focusing on your career, maybe you’re dealing with the dating world, maybe you’re unsure of your next step. Wherever you are in this time of growth and transition, we have something for you…except a good name for your demographic. Sorry. It happened. You are officially “tied down”. Being a parent to young ones is hard. We are intentional to offer classes on different days and times, often with childcare. We offer several events and missional opportunities where you can bring kiddos. We also some activities that are just for adults. You know, those times just for you (remember those?). The Young Adult Ministry often partners with our active Children and Family Ministries as well as our preschool (Circle of Friends) to support you and your family. Mom… Dad…Parent… you got this. You are not alone! For more information or to get connected to a young adult community, please contact Pastor Winter Hamilton.